Labor Party of Turkey: Deceleration on the economic crisis | Fight Back! But the mid-term New Economic Plan (YEP) announced by the Minister of Treasury Berat Albayrak, is an admission of a rapid deterioration into a crisis. Regardless of AKP attempts to define it, the dependent capitalist system and policies pursued by its staunch defender, the Erdoğan administration, are the cause of this crisis. Since taking power, Erdoğan’s focus has only been interests of himself and the capitalists behind him, working to enhance their gains. He is now trying to minimise his losses through this period; even trying to turn it into an advantage for himself. The YEP is the product of such an attempt. YEP, planned to span the next three years, predicts a smaller economy; a drop in industrial production; ever higher current account deficit; higher inflation and unemployment. This programme is a clear announcement of the beginning of a crisis, ‘heralding’ the hardship awaiting public in the coming months. The roadmap for the economy in general, and public finances and employment in particular, summarises how the working classes will be made to pay for the crisis. With this economic program, turning the crisis into an opportunity, the gifts for the capitalist classes include; incentives, removal of redundancy pay, widespread flexible and part-time work, freezing of wages, reduction in social spending. Working classes will be stripped of their historical gains. YEP means the BES cuts - introduced as ‘individual retirement insurance’ but in essence another way of squeezing money out of the public - becoming established or the two month withdrawal period be extended until the end of the program.. The public is told to accept this fraud and impoverishment; put up with it in the name of the survival of the country and the state. But, claiming that “austerity does not apply to prestige” they are building themselves palaces, purchasing luxury planes; not bothered at all by servicing their luxurious lifestyle by the public purse, at a time where suicides due to poverty and unemployment are on the rise. Austerity is a sacrifice demanded only from workers. The public must adhere to this austerity; without any complaints about the high cost of education and healthcare, marketisation of public services, unemployment or lack of job security. Otherwise, the example of third airport workers- prosecuted for complaints on working conditions - should be a lesson; regardless of the level of oppression they suffer, they must be convinced that their complaint is a result of their own psychological problems! The most striking recommendations of YEP to reduce the current accounts deficit, are the development of health tourism and an increase in the consumption of national products, linking it to the ‘national unity project’. Turning provision of health into a commodity led to health being the victim of economic interest; government guarantee of patients for hospitals built under public-private partnerships. On the other hand, in terms of agricultural output, the country has been turned into a desert under the 16-yer rule of AKP; all grains, fruit and veg, and even hay is imported. There is no domestic product to be consumed. Sackings already started due to crisis; workers are sentenced to poverty wages, with the threat of unemployment if their factories are shut; unpaid and forced holidays are on the increase; the abortion of collective bargaining agreements is on the agenda. Prices already burning holes in pockets; new price rises and direct/indirect taxes are on their way. Wages and rights of the workers are not the cause of this crisis; they have been well-pruned in the last 16 years.The debt that the government promised to pay the monopolies is not the debt of the 81 million, as stated by Necdet Takva, the TOBB (The Union of Chambers and Commodity Exchanges of Turkey) Council Leader. Hence, this debt cannot be paid by the public; those that created this debt should be paying it. 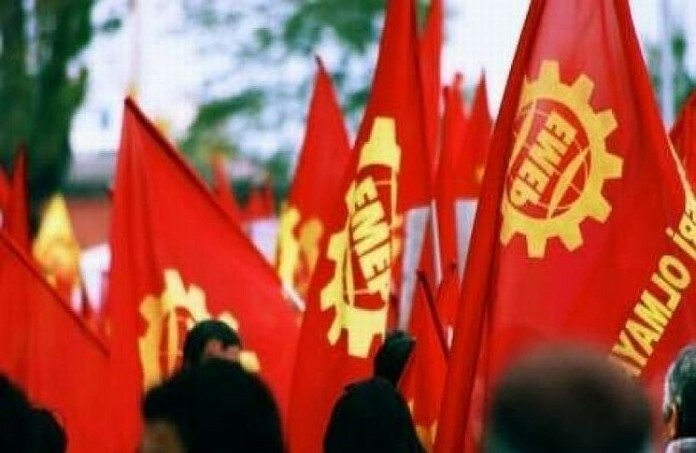 The fitting response to the call for sacrifice - targeting few pennies left in the pockets of the workers - came from workers in Makel, Mercedes, the third airport, Cargill and Tüpraş. We are in no doubt that responses of this nature will increase. Crisis are periods where opportunity for coordinated struggle for the workers increase; workers can regain losses through such a struggle. In this context, wages eroded by price rises and exchange rate manipulations should be increased; minimum wage should be determined with poverty levels in mind; basic commodity prices should be frozen; unlawful sackings should be banned; workers’ wages should be paid first in businesses that close down or go bankrupt. Meeting of these demands is compulsory to redress the losses and to establish minimum welfare. Workers will not give up on these demands. Policies that threaten their living and working conditions can only be defeated by a united struggle. Our party will work for this struggle to grow and strengthen.